From Manufacturer's Website: "TA precious nature’s element seeked in the deep ocean of the Atlantic, pearl is rich in amino acid, collagen and minerals. 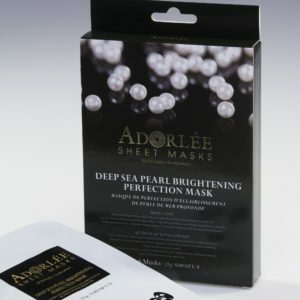 With the infusion of pearl powder, the mask hydrates and enriches the skin, recovering the glow and radiance instantly. It repairs the skin cell and helps to induce collagen production, achieving a more smooth and supple look for your skin." 1 individually wrapped mask. Comes in : Deep Sea Pearl Brightening Perfection Mask.